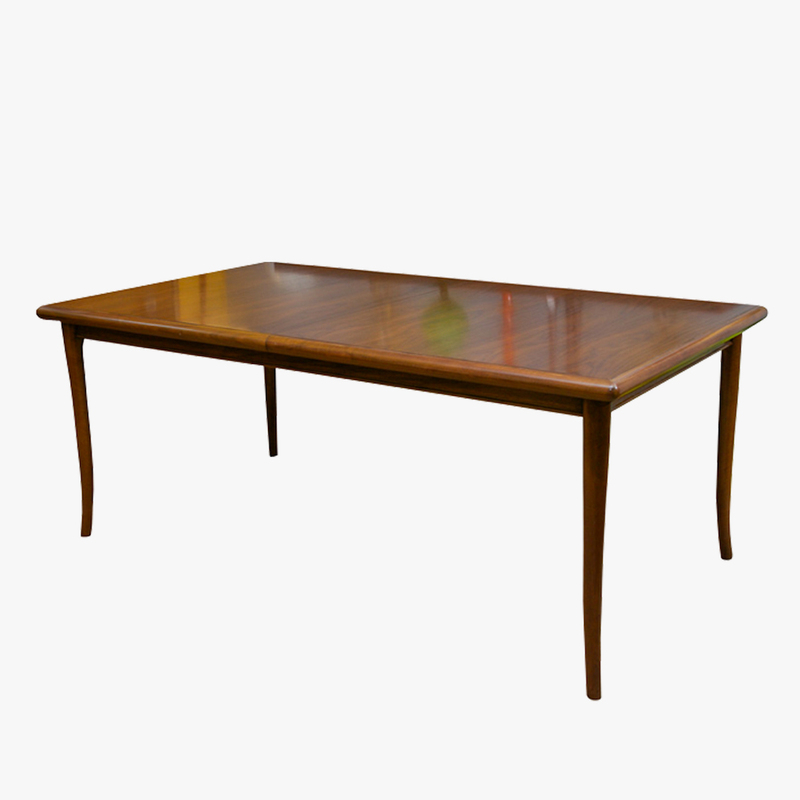 Extension dining table by T.H. 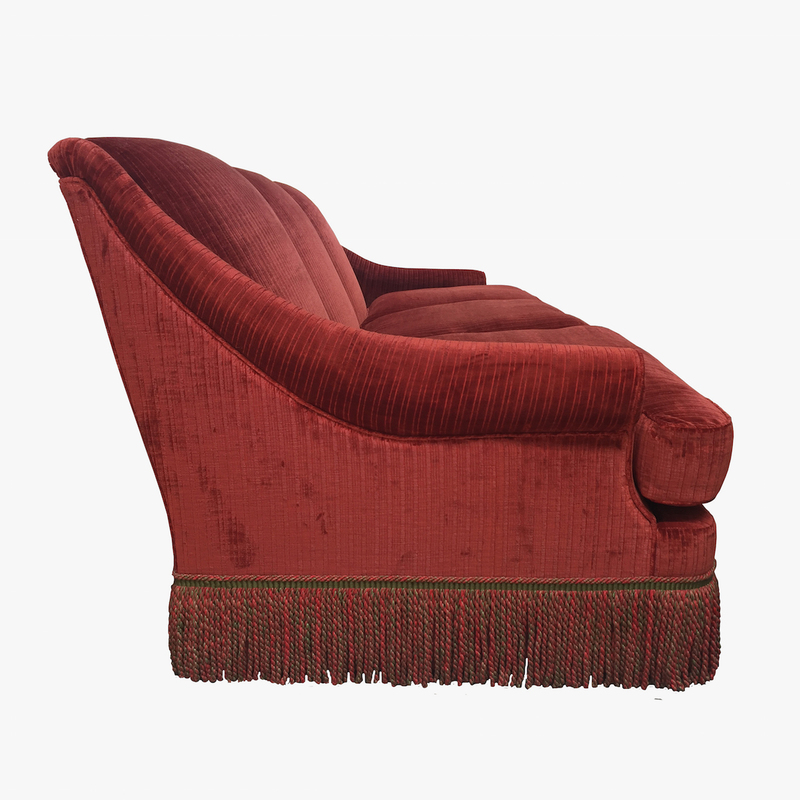 Robsjohn-Gibbings for Widdicomb, USA, c.1960, approx. 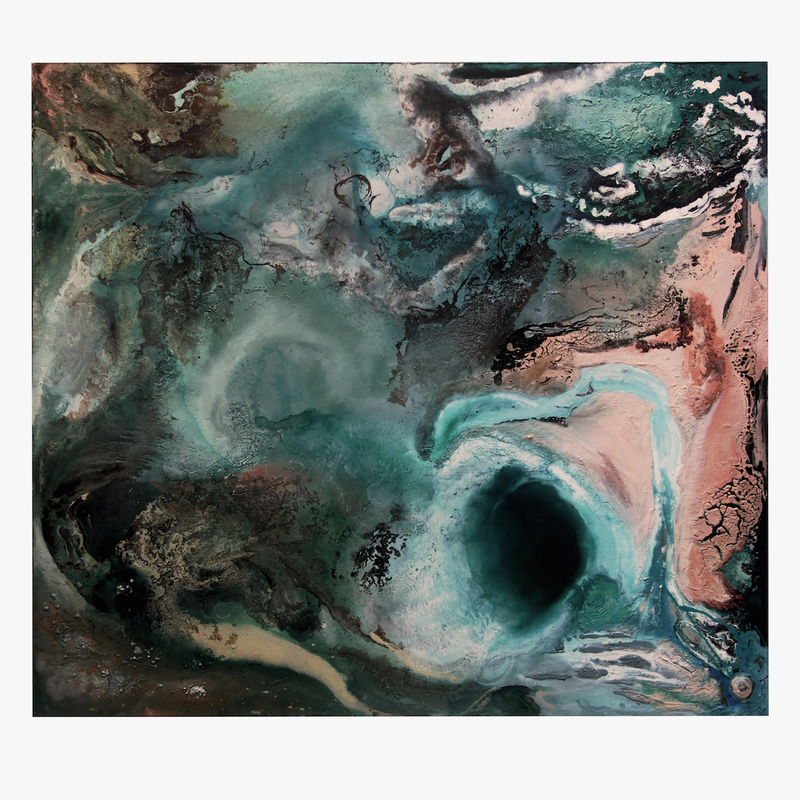 183 long x 76 high x 100cm deep (ref. 421-F). Available now. 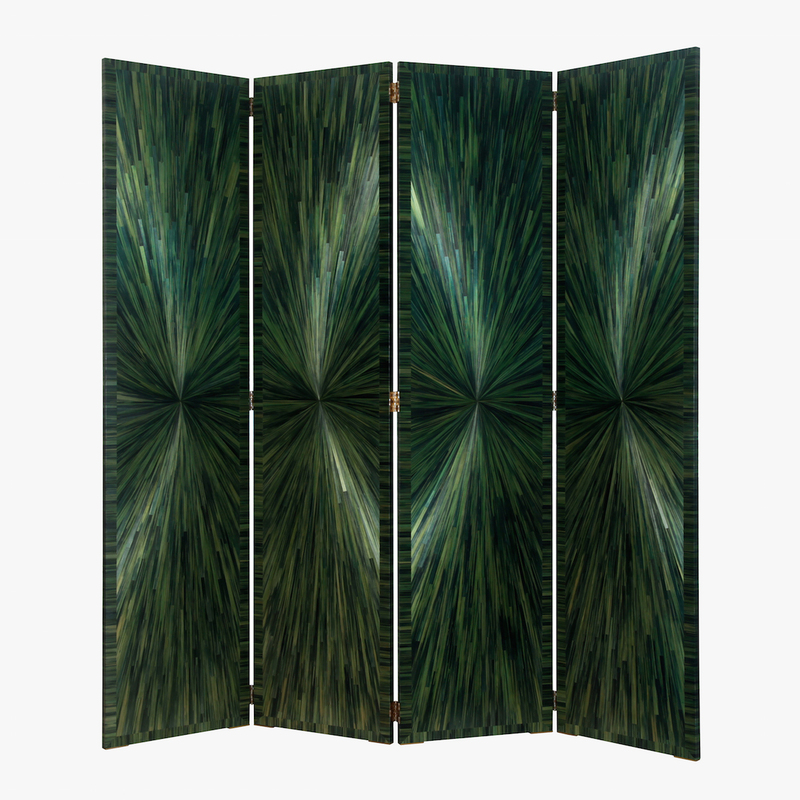 Four panelled screen in lacquered parchment by Aldo Tura, Italy, 1960′s, 201cm tall with each panel measuring 50cm wide (ref. 247-F). Available now. 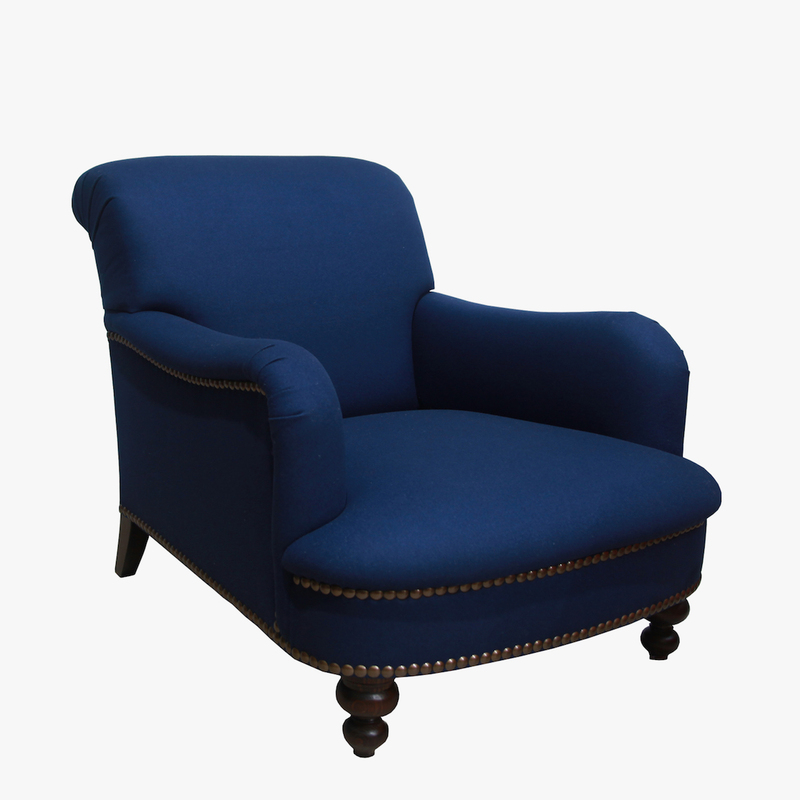 Edwardian armchair with scroll arms on raised, turned legs and brass castors, England, c.1910, newly upholstered in Rogers & Goffigon linen/cotton (ref. 505-F). Available now. 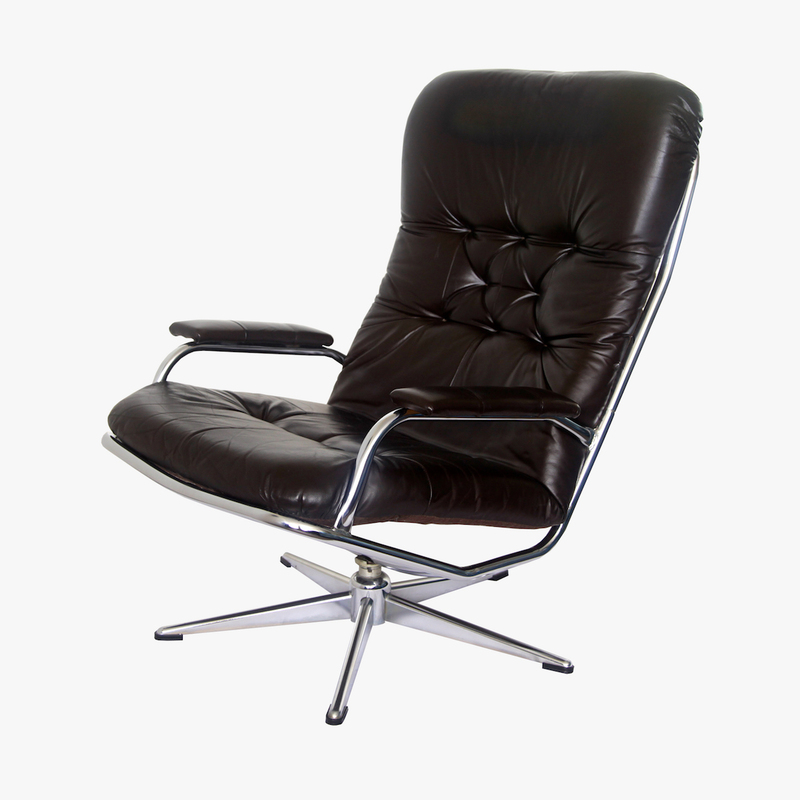 Swivel lounge chair in chromed steel with original leather upholstery, France, c.1970, includes matching footstool (ref. 360-F). Available now. 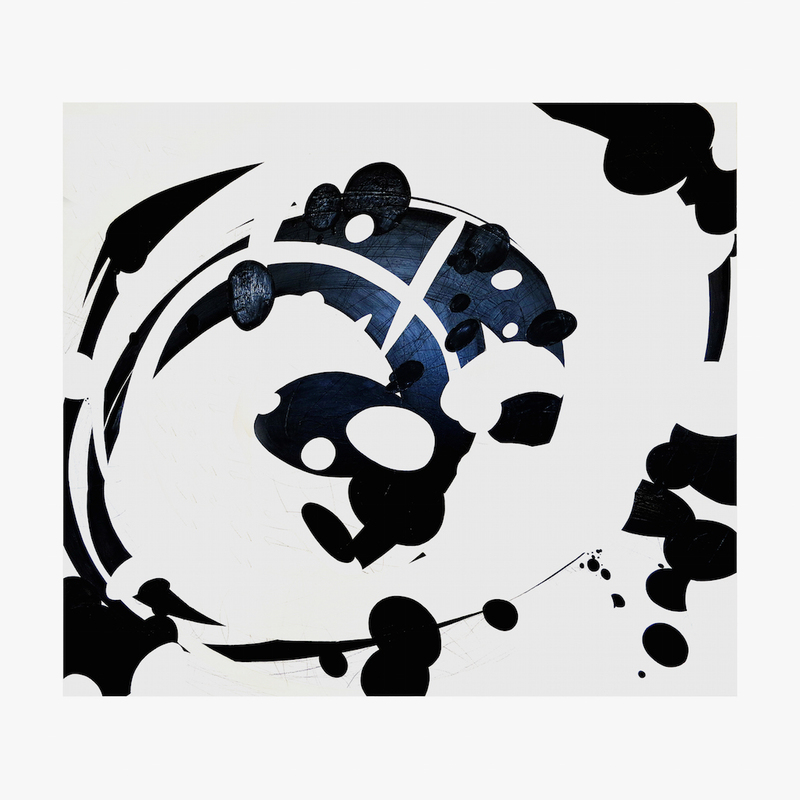 Sean Brackin (USA), Radiant Dot, 2014, oil and graphite on canvas, 108 x 123 (ref. 439-A). Available now. 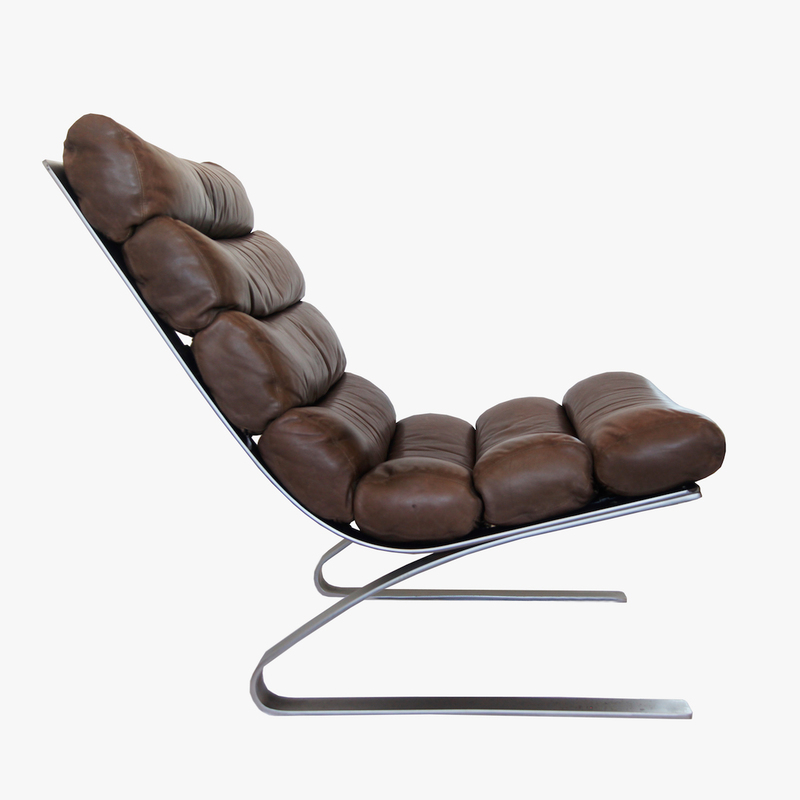 'Sinus' lounge chair by Adolf & Schröpfer, chromed steel with original chocolate brown leather upholstery, Germany, 1970/80's, 77 x 87 x 87cm high (ref. 503-F). Sold. 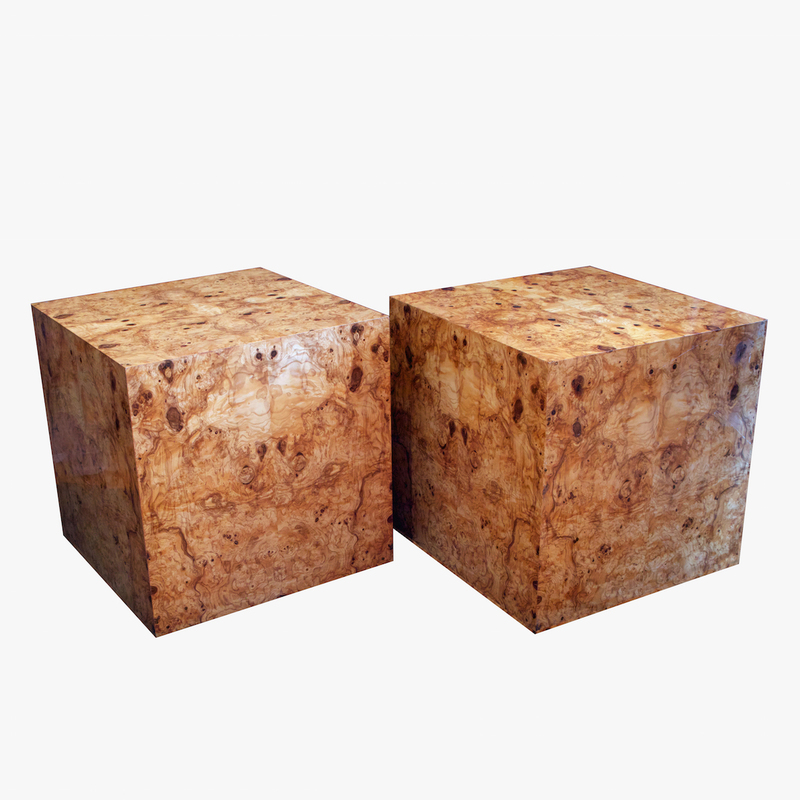 Pair of Karl Springer occasional tables in burl olivewood and American oak, USA, 1970's, 61 x 61 x 61cm (ref. 130-F). Sold. 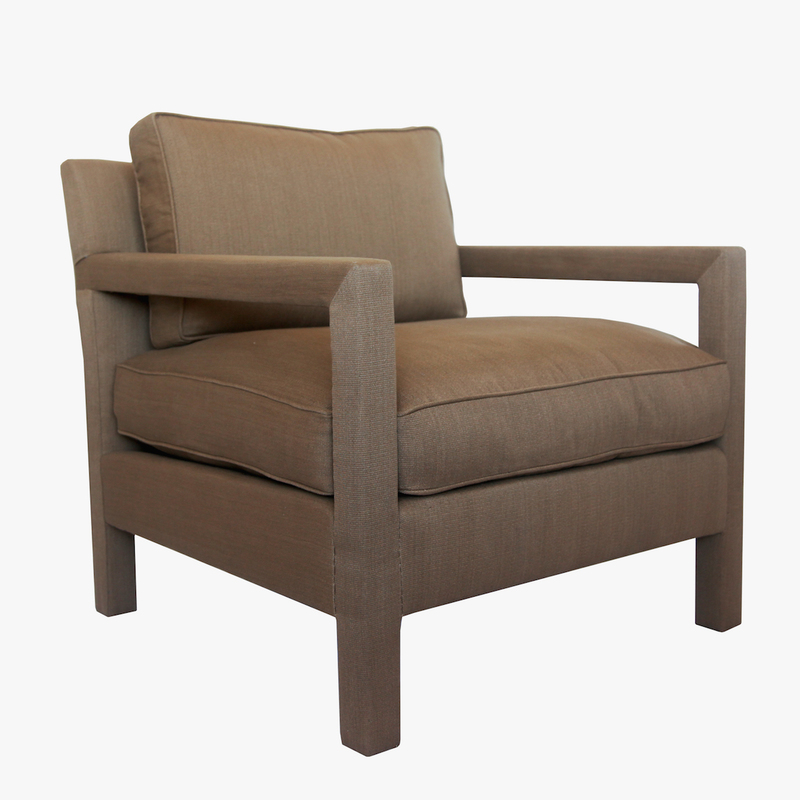 Pair of custom Milo armchairs, Rogers & Goffigon linen/cotton upholstery, 75 x 75 x 73cm high (ref. 410-F). Available now. 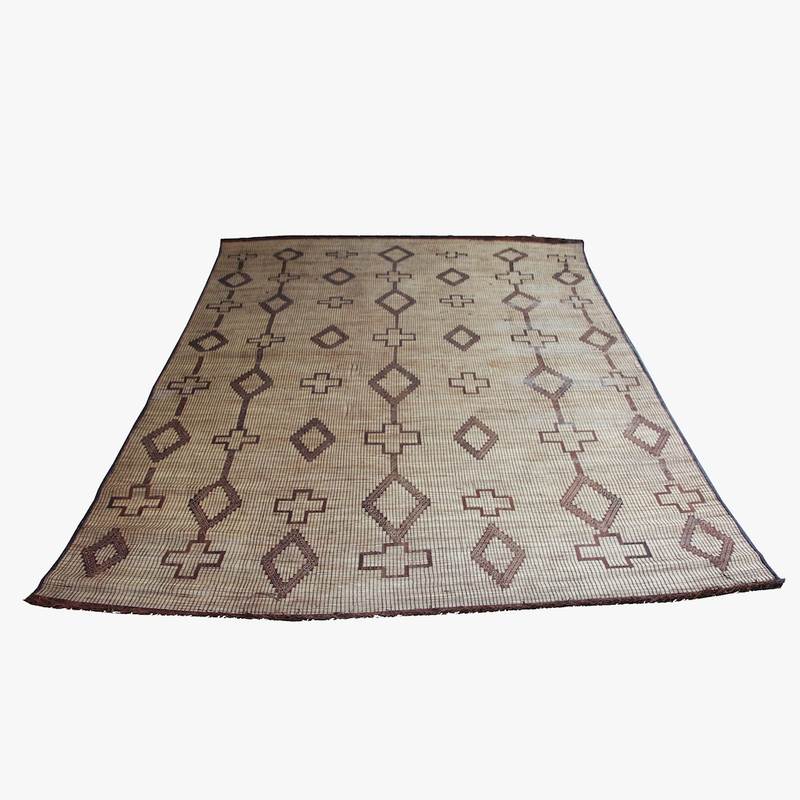 Handwoven Tuareg mat in palmwood and goatskin, Mauritania, 1980′s, approx. 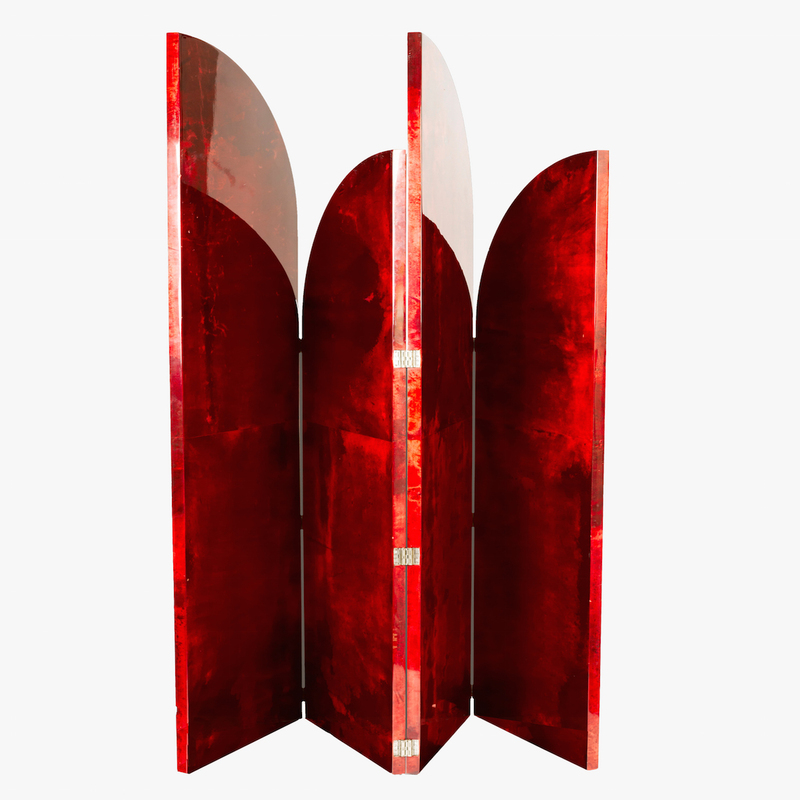 520 x 315cm (ref. 337-C). Available now. 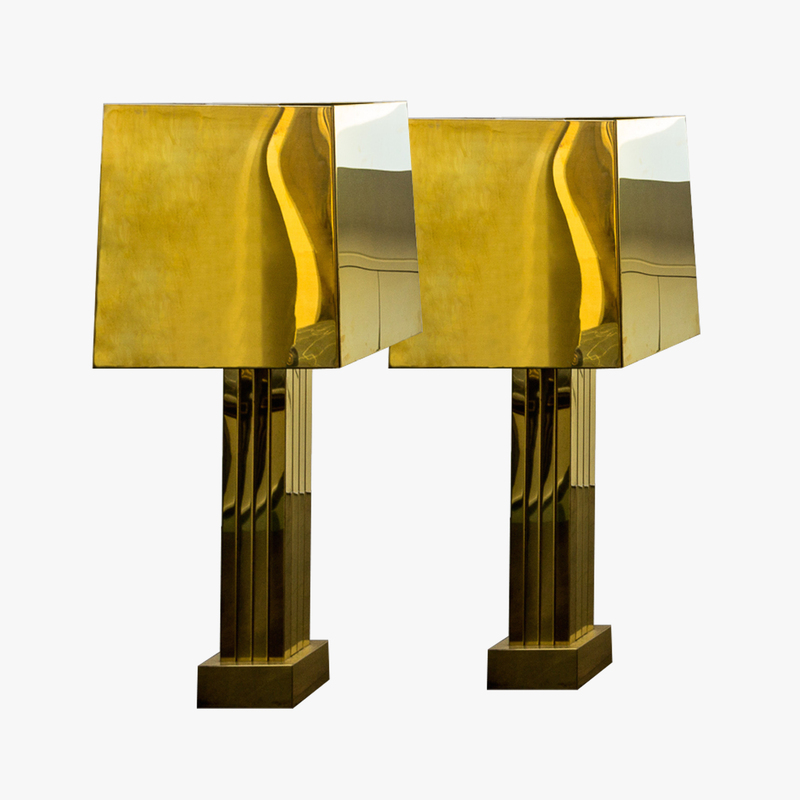 Pair of large scale, brass table lamps signed C. Jeré with integrated brass shades, USA, 1970's, 108cm tall (ref. 417-L). Sold. 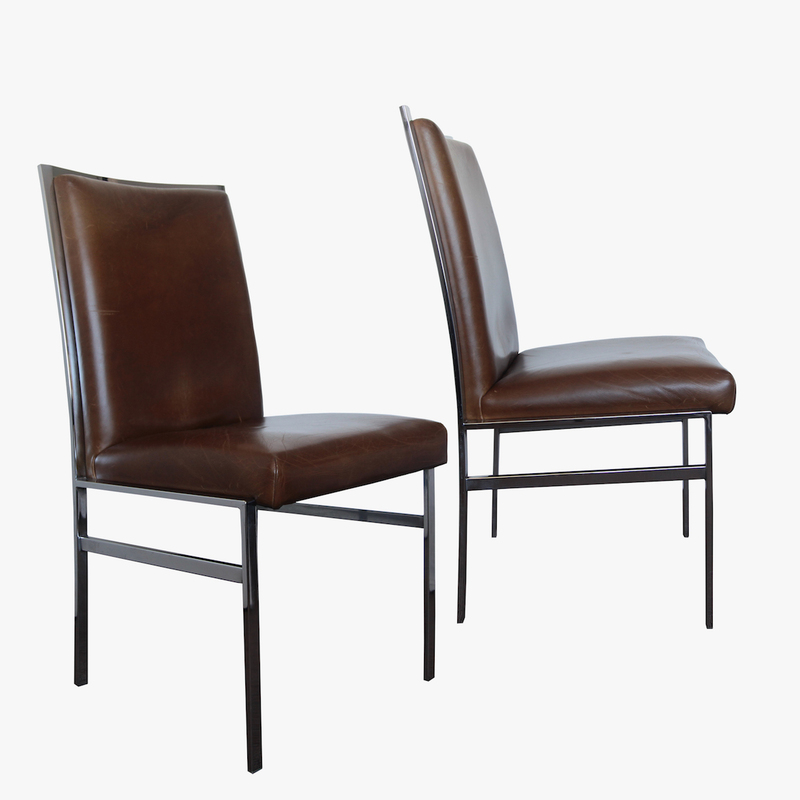 Set of four dining chairs by Pierre Cardin, chromed steel and leather upholstery, France/USA, c.1975, 53.5 x 64.5 x 96cm high (ref. 199-F). Available now. 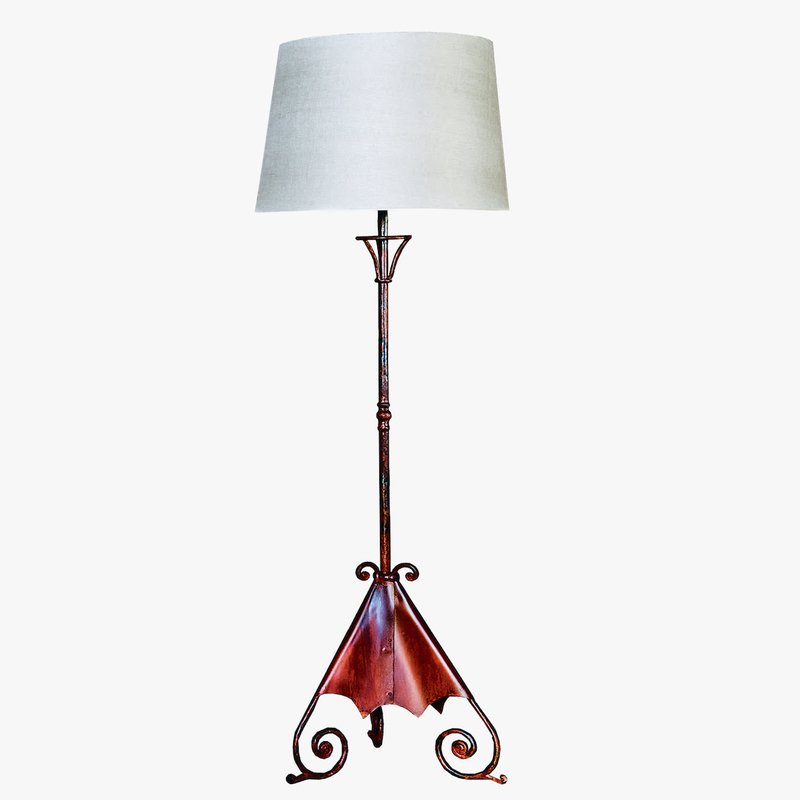 Custom 'Machiavelli' floor lamp with glazed linen shade, 210cm high (ref. 499-L). Made to order. 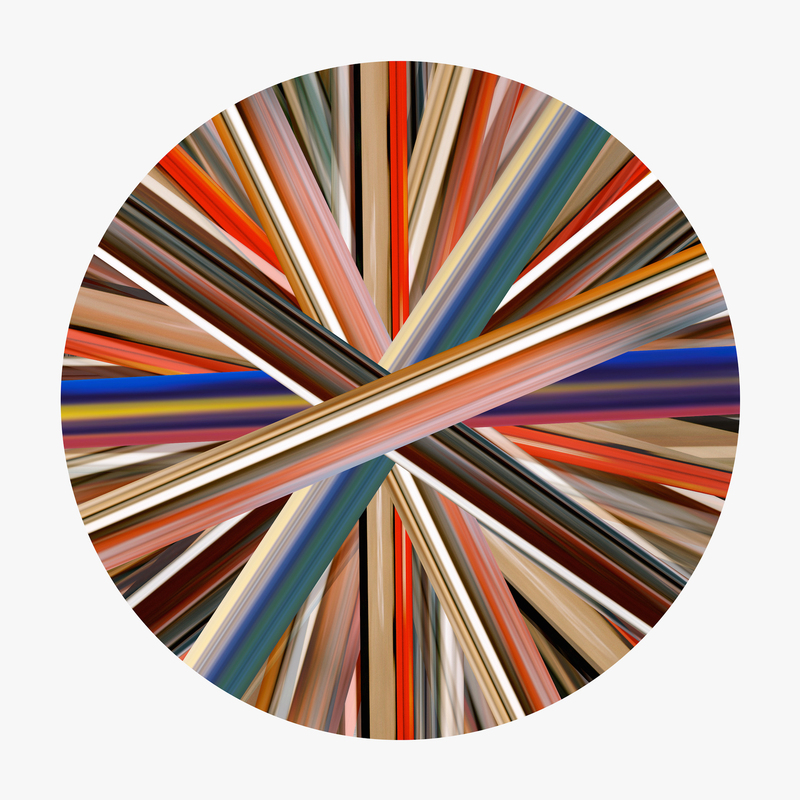 Eduardo Santos Wheel of Light, edition 1/5, chromogenic print in acrylic float frame, 120cm diameter (ref. 501-A). Made to order; other sizes available. 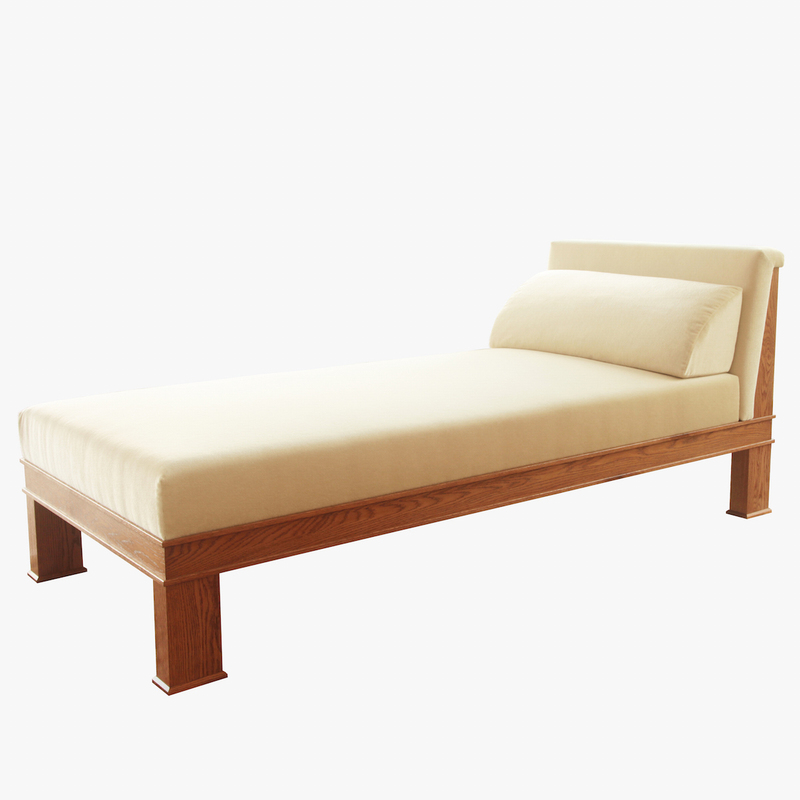 'Marc' daybed in oak and mohair velvet upholstery, 210cm long (ref. 498-F). Made to order; other timber, finish and upholstery options available. 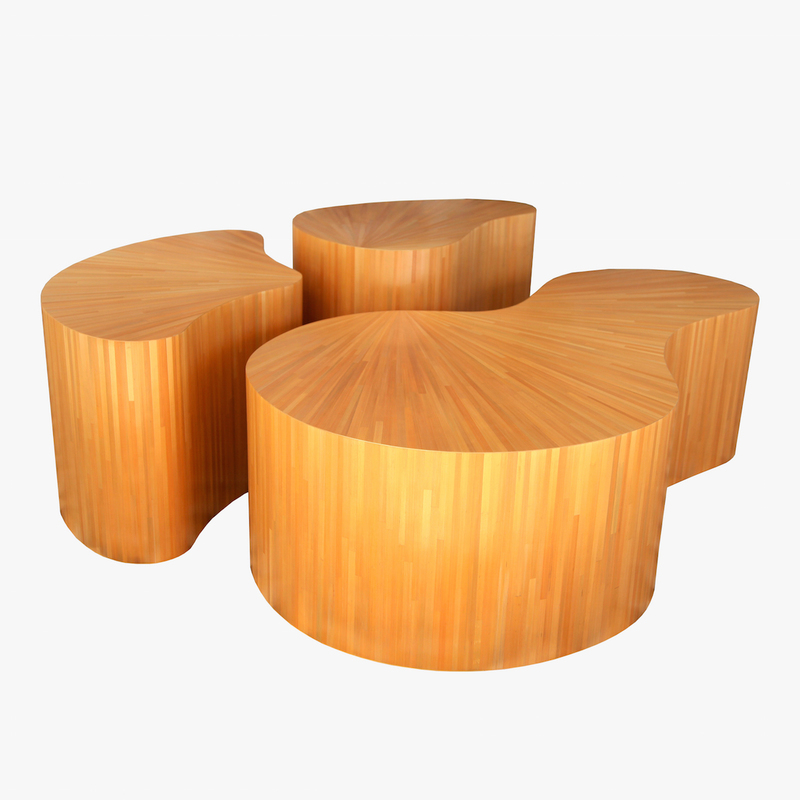 Three piece 'Freeform' coffee table in straw marquetry (ref. 495-F). Made to order; other colours available. 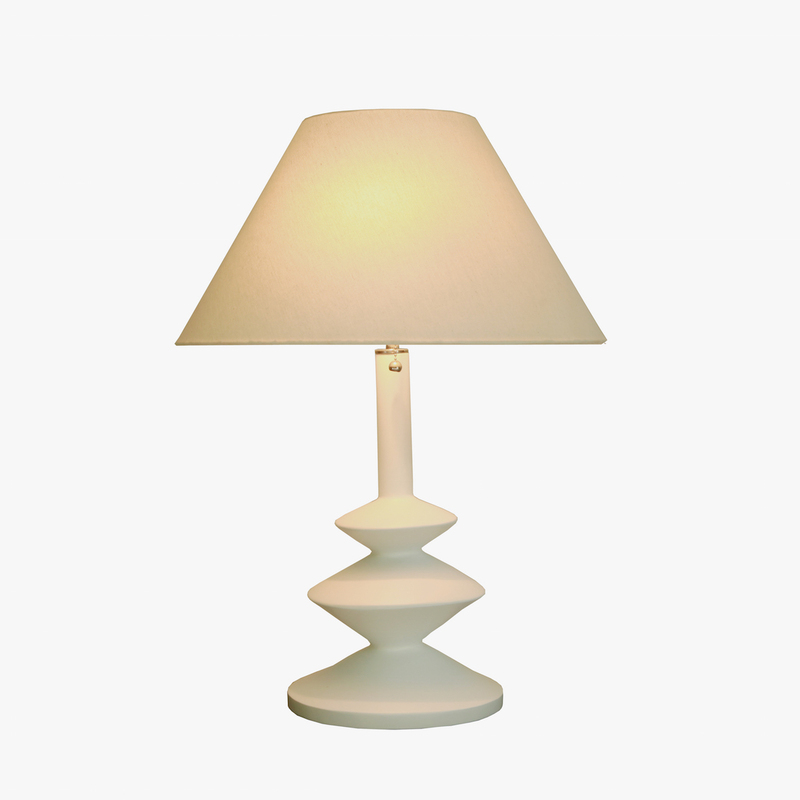 Contemporary table lamp in white plaster with linen shade, after the design by Alberto Giacometti for Jean-Michel Frank, 71cm tall (ref. 493-L). Made to order. 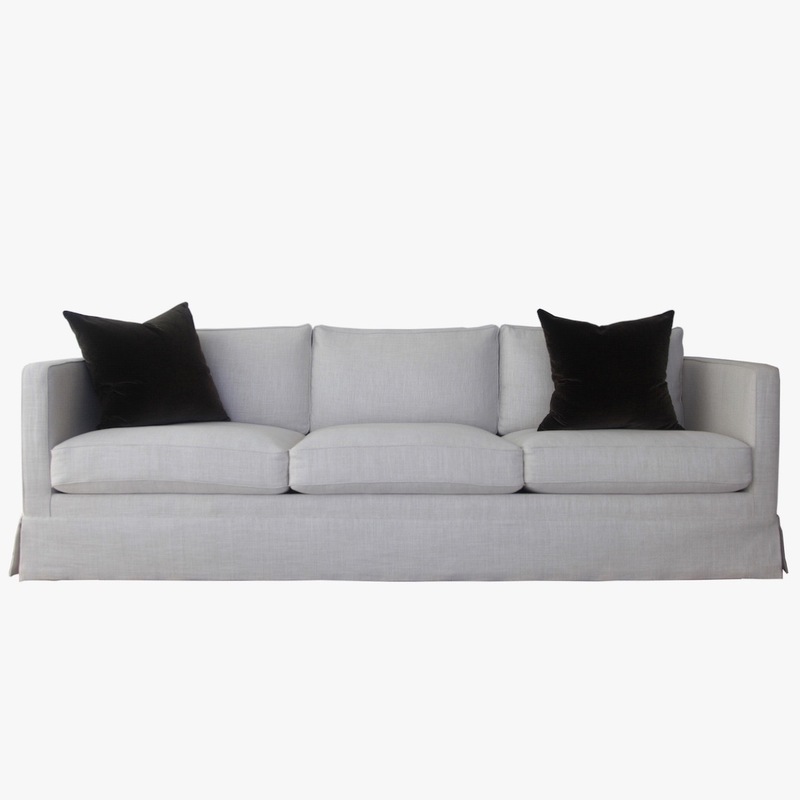 Custom Edwardian style three-seat sofa (ref. 494-F). 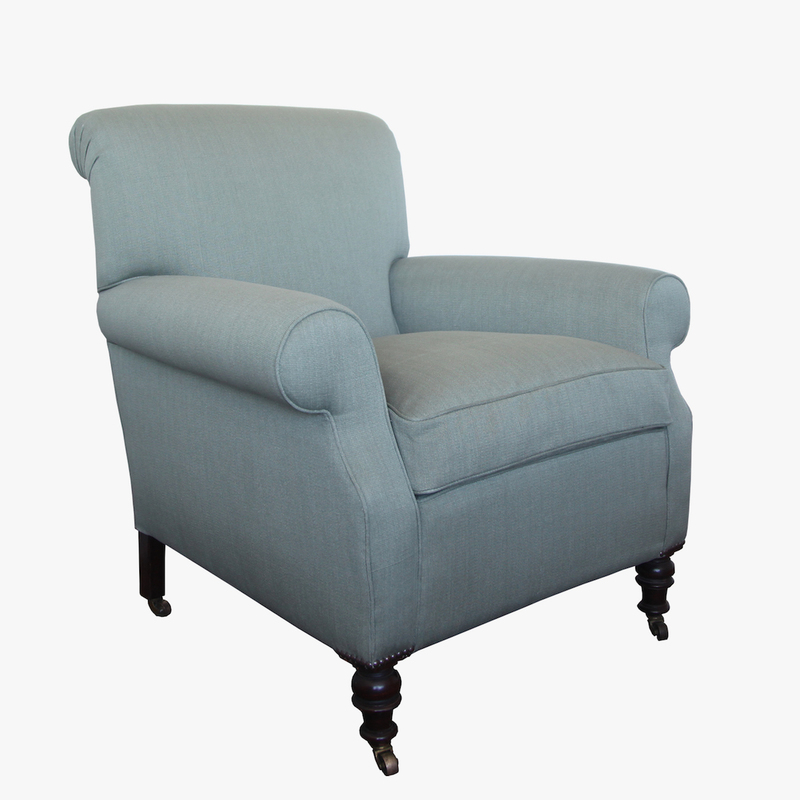 Made to order; other upholstery options available. 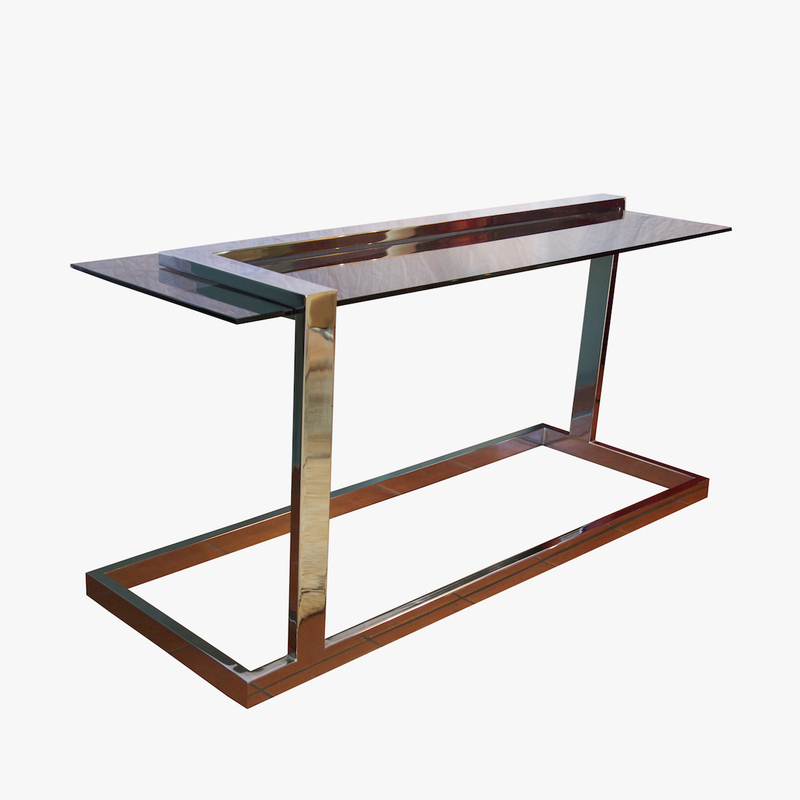 Cantilevered console table in chromed steel and smoked glass by Milo Baughman, USA, 1970's, 138 x 48 x 66cm tall (ref. 200-F). Sold. 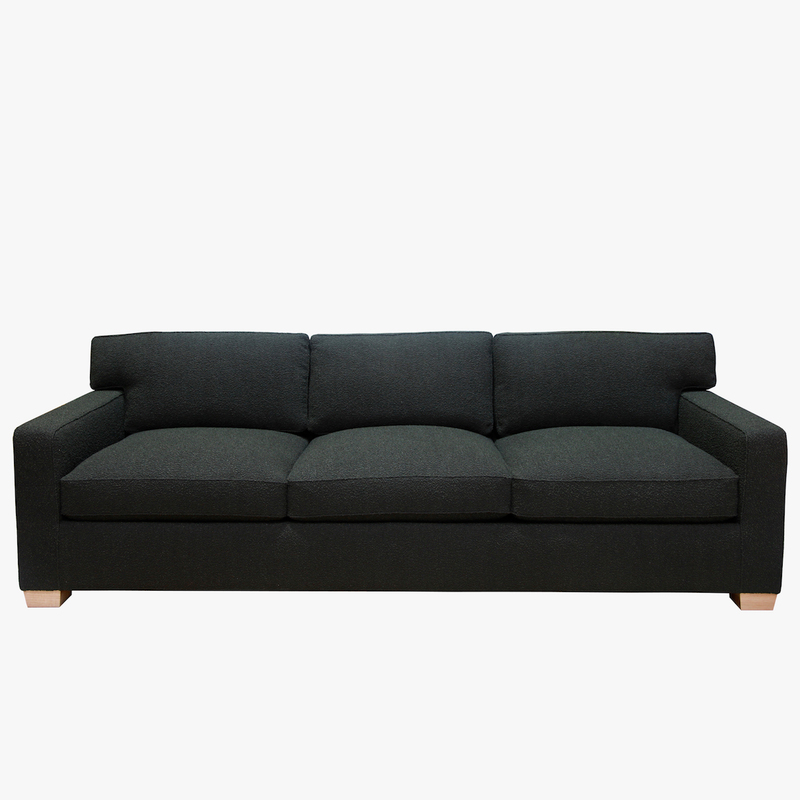 Custom three-seat Billy sofa (ref. 496-F). Made to order; other upholstery options available. 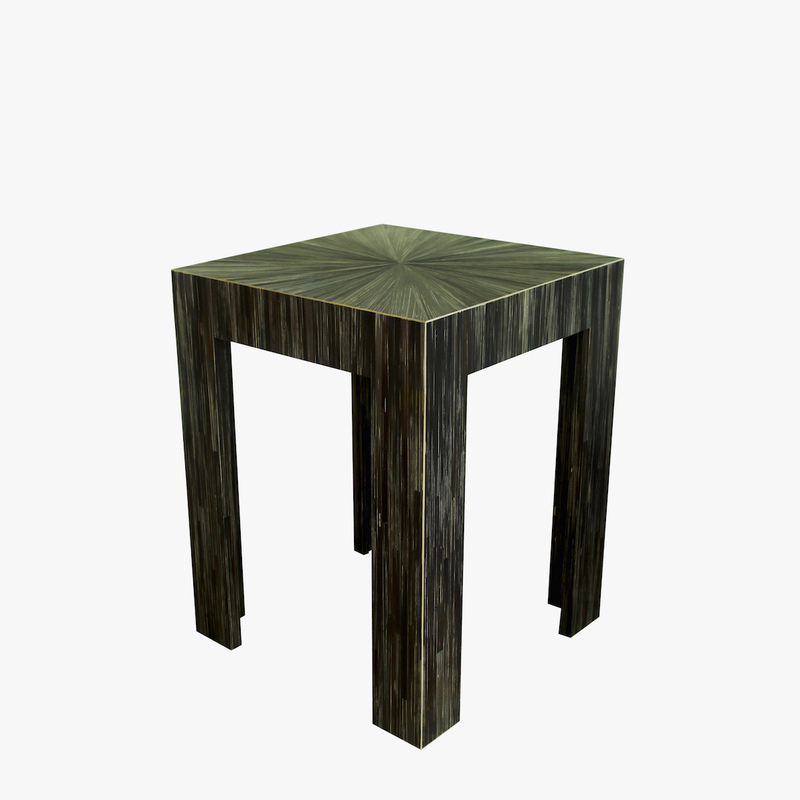 Custom occasional table in straw marquetry (ref. 493-F). Made to order; other colours available.